Set the dial on the end of blue low flow regulator to 0 (zero). Using the included black wrench, turn the silver valve stem on top of the tank slowly counterclockwise until it stops. If the top valve has a short toggle arm, you will not use the wrench. Connect the breathing tube to the port on the bottom side of the blue regulator (beneath the adjustable dial) and adjust the nose piece for comfort (to the nose, over the ears, and back in front of you). Adjust the dial on end of the blue regulator to 1.5 liters per minute for normal usage. Do not exceed 2 liters per minute. 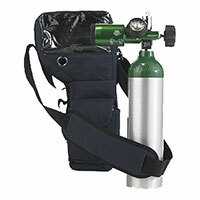 HEAT – Keep all oxygen equipment, including tubing, at least 10 feet away from any source of heat. SMOKING – For your health and safety, smoking should not be permitted in the same room where oxygen is used or stored. PETROLEUM PRODUCTS – Never use grease, oil or other petroleum products on or near any oxygen equipment, including tubing.